In brief: when Cueto returns, who leaves? 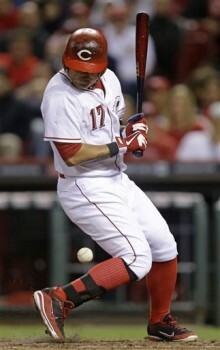 After sweeping the series with the Cubs, the Reds lost the series opener against the Braves last night, 7-4. Bronson Arroyo had another rough start, giving up 4 runs (earned) on 8 hits and 2 walks through 5.0 innings. Alfredo Simon pitched 2 innings of hitless relief, but Logan Ondrusek gave the Braves their winning margin: 3 runs (earned) on 3 hits and 1 walk in the eighth. It was too late by the time J. J. Hoover closed it out without a hit. Zack Cozart’s ears must have been burning, because he suddenly pulled out a 2-hole worthy performance, going 2-for-5 with 2 runs scored. The Reds try to even the record against the Braves tonight. It’s the hot-hitting Homer Bailey (RHP, 1-3, 3.38 ERA) tonight against Kris Medlen (RHP, 1-4, 3.38 ERA). First pitch at 7:10 p.m.
On May 13, Johnny Cueto left a game after experiencing pain in his right lat and oblique muscles. They put him on the 15-day DL a couple days later. He might have been back already, except he suffered a setback, causing all of Redsland to suddenly realize how lucky we were about injuries last season. “He did very well. He looked very good and said he felt very good,” head trainer Paul Lessard said. Cueto is scheduled to see Dr. Tim Kremchek later today and will probably have another bullpen session before thoughts of a rehab assignment resume. The question is: when Cueto comes back, who leaves? Tony Cingrani, who’s been taking Cueto’s spot in the rotation, has outperformed 60% of the other starters while he’s been with the team. As far as ERA is concerned, he’s almost as good as Cueto himself was, and leads Bailey, Mike Leake, and Bronson Arroyo by 3/4 of a run or more and his WHIP is sub-1. Not bad for a rookie. The Reds have won all 5 home series they’ve played so far this season. This post is here as part of my answer to the weekly Red Reporter round-table question. Go to Red Reporter to read my and a bunch of different bloggers’ thoughts on how the Reds should fill the #2 hole.